Congrats are in order for the newlyweds!! Ciara and Russell Wilson tied the knot today with an intimate ceremony that was held in a castle in England in front of their closest friends and family. The newlyweds sealed the deal by posting the pic above to both of their Instagram account captioned "We are the Wilsons". The singer and football player have been dating for a while now and they seem like an awesome couple. Ciara looked amazing in her Cavalli dress while Russell and Baby Future kept it dapper in Giorgio Armani. 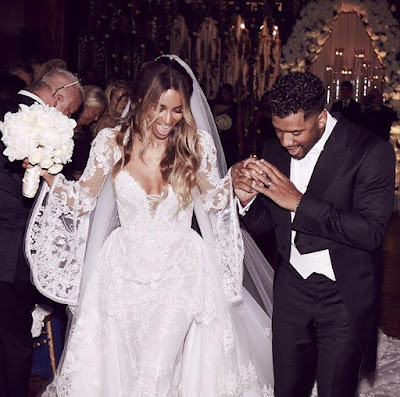 Of course the wedding was a star studded affair with guests ranging from Jennifer Hudson, to best friends LaLa Anthony and Kelly Rowland. Her other bestie Serena Williams was supposed to be apart of the wedding, however, she was not able to make it to the wedding due to her Wimbledon semi-finals match (I'm sure Ciara definitely understood the circumstances). The wedding was probably super beautiful, as is the couple. They look like they are super happy in the picture.... hell in all pictures!! Love is a beautiful thang.... Black Love is even better. Once again, congratulations to the both of the and we wish them a lifetime of happiness.